If you have been to Cheonggyecheon (or Cheonggye Stream) in Seoul, have you noticed the mural (an extract of which is shown in the above photo) between the Gwanggyo Bridge (광교) and the Samilgyo Bridge (삼일교)? 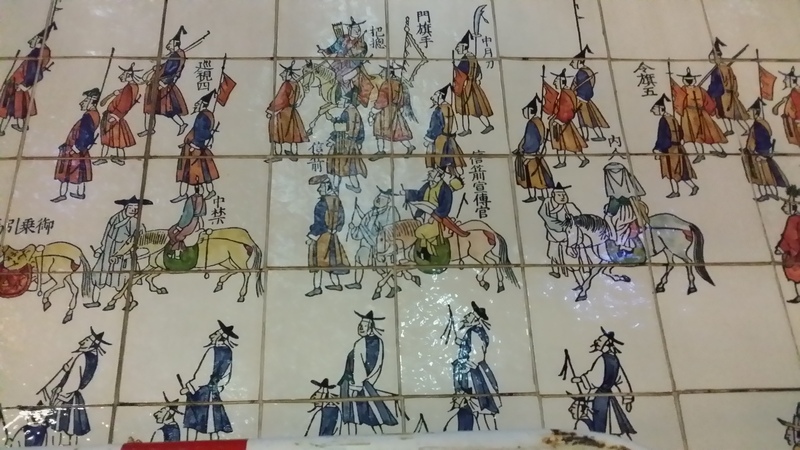 The mural is an extract from the Uigwe (의궤 – literally means “a model for rituals”), the Royal Protocols of the Joseon Dynasty. The Uigwe was inscribed into the UNESCO Memory of the World Register in 2007. Let’s talk about the valuable Uigwe in this blog post. Uigwe is a collection of books recording in classical Chinese text and colourful illustrations the important state ceremonies and events of the Joseon royal family including royal wedding of the king and queen, crowning of the prince, the succession of the new ruler, funerals, royal tomb construction, etc. The classical Chinese text explains each process of the ceremony or event in detail and is supported by illustrations elabo­rately drawn by hand. During the Joseon period, the Uigwe served as a valuable reference for later generations when organizing similar cer­emonies or events, thereby minimizing trial and error. Nowadays, the Uigwe is an important source document for us to understand the Korean traditional royal culture. The main contents of each volume of Uigwe include: (1) discussions on holding the ceremony or event; (2) names of the officials in attendance as well as the artisans who made the implements used in the ceremony or who worked on the construction proj­ect, (3) activities performed on each day leading up to and dur­ing the event or throughout the project period, (4) an account­ing of expenditures on labor and materials, (5) illustrations of key scenes and implements used, and (6) the Uigwe volume compilation process. Usually 5 to 9 copies of each volume were produced in one of the two versions, regular and deluxe. Only one copy of the deluxe version was produced exclusively for the king’s perusal – that’s why the quality of the deluxe version was far supe­rior to the regular version in terms of the calligraphy, illustrations, pro­duction materials, printing, and binding. The other copies are kept in various libraries and depositories in Korea. Currently, about 4,000 volumes of Uigwe produced from 1600 to 1906 remain as the volumes produced before this period were all destroyed due to wars. Some volumes previously seized by foreign countries were returned in 2011. For example, nearly 300 volumes of Uigwe were seized by the French troops in 1866 during their invasion of Ganghwa in retaliation of the execution of French Catholic priests by the Joseon government. After negotiations between the South Korean and French governments, these Uigwe copies were returned to South Korea on a 5-year renewable loan basis in 2011. As the French government promised not to reclaim these Uigwe copies, the return was in effect permanent. On the other hand, Japan also seized about 1,200 volumes of Uigwe in 1922 during the Japanese colonial rule, and these volumes were returned to South Korea in 2011. Next time you visit Seoul, you may go to Cheonggyecheon to have a look at the Uigwe mural. ← Let’s go hiking in Inwangsan!